The Mundane and the Music | "music washes away from the soul the dust of everyday life"
Last year I got to explore some of the heavier repertoire for the mezzo soprano voice and included in this was the aria Stride la Vampa! from Giuseppe Verdi’s opera Il Trovatore. As soon as I listened to the piece and read the story behind it I fell in love with it. The mystical undercurrents in the music and the horror and madness conveyed with the lyrics really spoke to me and I would love to be able to do Azucena on stage for real one day. 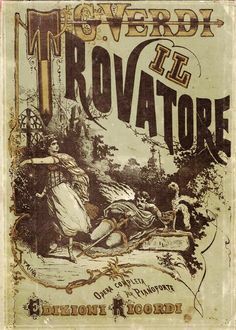 Il Trovatore is an opera in four acts by Giuseppe Verdi and on the surface it is about the love triangle between the troubadour Manrico, Count di Luna (junior) and the lady in waiting Leonora. But beneath it all is the story about the gypsy woman Azucena and her quest for revenge on Count di Luna (senior). The story is quite complex and thrilling and below is a somewhat brief synopsis taken from the wiki-article about the opera. Ferrando, the captain of the guards, orders his men to keep watch while Count di Luna wanders restlessly beneath the windows of Leonora, lady-in-waiting to the Princess. Di Luna loves Leonora and is jealous of his successful rival, the troubadour Manrico. In order to keep the guards awake, Ferrando narrates the history of the count: many years ago, a gypsy was wrongfully accused of having bewitched the youngest of the di Luna children; the child had fallen sick and for this the gypsy had been burnt alive as a witch, her protests of innocence ignored. Dying, she had commanded her daughter Azucena to avenge her, which she did by abducting the baby. 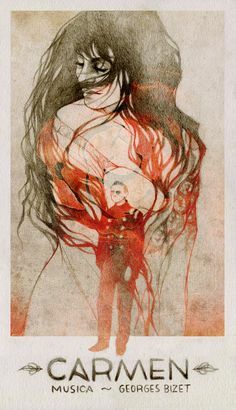 Although the burnt bones of a child were found in the ashes of the pyre, the father refused to believe in his son’s death; dying, he commanded his firstborn, the new Count di Luna, to seek Azucena. Leonora confesses her love for Manrico to her confidante, Ines. When they have gone, Count di Luna hears the voice of his rival, Manrico, in the distance. While Leonora in the darkness mistakes the count for her lover, Manrico himself enters the garden, and she rushes to his arms. The count recognises Manrico as his enemy, who has also been condemned to death due to his political affiliations, and challenges him to a duel over their common love. Leonora tries to intervene, but cannot stop them from fighting. The gypsies sing as they work by their anvils. Azucena, the daughter of the Gypsy burnt by the count, is still haunted by her duty to avenge her mother (Stride la Vampa!). The Gypsies break camp while Azucena confesses to Manrico that after stealing the di Luna baby she had intended to burn the count’s little son along with her mother, but overwhelmed by the screams and the gruesome scene of her mother’s execution, she became confused and threw her own child into the flames instead. Manrico realises that he is not the son of Azucena, but loves her as if she were indeed his mother, as she has always been faithful and loving to him. Manrico tells Azucena that he defeated di Luna in their duel, but was held back from killing him by a mysterious power. A messenger arrives and reports that Leonora, who believes Manrico dead, is about to enter a convent and take the veil that night. Although Azucena tries to prevent him from leaving in his weak state, Manrico rushes away to prevent her from carrying out this intent. Di Luna and his attendants intend to abduct Leonora and the Count sings of his love for her. Leonora and the nuns appear in procession, but Manrico prevents di Luna from carrying out his plans and takes Leonora away with him. Di Luna and his army are attacking the fortress Castellor where Manrico has taken refuge with Leonora. Ferrando drags in Azucena, who has been captured wandering near the camp. When she hears di Luna’s name, Azucena’s reactions arouse suspicion and Ferrando recognizes her as the murderer of the count’s brother. Azucena cries out to her son Manrico to rescue her and the count realizes that he has the means to flush his enemy out of the fortress. He orders his men to build a pyre and burn Azucena before the walls. Inside the castle, Manrico and Leonora are preparing to be married. She is frightened; the battle with di Luna is imminent and Manrico’s forces are outnumbered. He assures her of his love, even in the face of death. When news of Azucena’s capture reaches him, he summons his men and desperately prepares to attack. Leonora faints. Manrico has failed to free Azucena and has been imprisoned himself. Leonora attempts to free him by begging di Luna for mercy and offers herself in place of her lover. She promises to give herself to the count, but secretly swallows poison from her ring in order to die before di Luna can possess her. Below is a recording of me performing Stride la Vampa! at my senior recital this spring. Carmen… one of the most well known operas in existance. The music is instantly recognizable and almost everyone has heard some part of it at one time or another. It is also a dream role for many mezzo sopranos. But for me it has been something of a headache. Carmen is usually portrayed as this sultry, seductive temptress that lures the poor, innocent Don José into ruin and despair. A lot of times Carmen is almost vulgar in her portrayal and this image of her as being somewhat of a tramp has made portraying her somewhat difficult for me. I realize that Carmen is one of the more difficult roles to play as well, considering it has been done so many times over the years. It takes a lot of work to find your own Carmen and to not replicate someone else, but despite that the stereotypical image of her has stayed with me and made my own portrayal of her difficult… until a few weeks ago. In school we have this performance class where we work on an aria or song from an operatic acting point of view. This means that during this masterclass we explore the character on a deeper level, find their motives, create the space and the situation they are in, find out their backstory and work woth the aria based on the things we’ve found. The first thing the teacher said to me after I told her about my troubles in getting into Carmen’s character was that i needed to drop every preconcieved notion of who Carmen is. We were going to find -my- Carmen, and to do that we needed to dig a bit deeper. We examined the lyrics of the song (the Habanera) as well as some of Carmen’s actions in the opera and what we came up with resonated with me. The Carmen we found is an incredibly self destructive force, an artist whose creativity has been blocked. Being cut off from any creative outlet is extremely painful and frustrating for her and to dull the pain and the frustration she turns towards self destructive behaviour patterns… anything to make the pain go away! She is also deathly afraid of committing to anything, especially any kind of relationship. Her view on love is pretty bleak, even if she deep down yearns and longs for it too. While she may appear confident and alluring to everyone around her she really hates herself for destroying her own life this way. To sing the Habanera completely alone and with such loathing and hatred towards myself, as well as with the glimmer of hope that love can be real, is exhausting. It is an immense challenge and by the end of every session I am completely drained emotionally. But it is also very satisfying when I realize the progress we’re making. Slowly, very slowly, we are finding a Carmen that is real. She is more than just a sultry seductress. You just have to look beneath the surface to find it. At my senior recital I performed the Flower Duet from the opera Lakmé by Léo Delibes together with my friend and classmate Emelie Lindquist. The Flower Duet is one of the most well known opera pieces and it has been used frequently in both movies and advertisements over the years. I think it is an amazingly beautiful piece of music and I love the way the harmonies between the two voices are written, it is almost magical. It was a privilege to perform this together with Emelie and I really like the way our voices fit together. The opera Lakmé first premiered on April 14th, 1883, at the Salle Favart in Paris. The setting is British India in the mid 19th-century and the story is about Lakmé, daughter of a Brahmin priest called Nilakantha. One day when Lakmé and her slave, Mallika, are down by the river to gather flowers Lakmé encounters a British officer called Gérald. They fall in love but when Nilakantha learns of this he vows to revenge this affront to his daughter’s honour. At a bazaar Nilakantha forces his daughter to sing to lure Gérald into identifying himself. When he falls for the trick Nilakantha stabs him and manages to wound him quite severely. 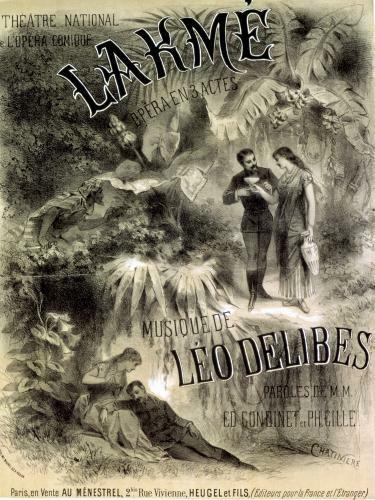 Lakmé takes Gérald to a secret hideaway in the forest and nurses him back to health. Lakmé and Gérald are set to perform vows of love to one another, but when Lakmé is away to fetch the sacred water required for the ritual Gérald’s comrade finds him and reminds him of his duty to his regiment and his country. When Lakmé returns she senses the change in Gérald and slowly comes to realize that she’s lost him. Heartbroken she decides to die with honour rather than live with dishonour and kills herself by eating the extremely poisonous datura leaf. Below is a recording of our performance of the Flower Duet from Act 1. Enjoy! At the piano is the ever amazing Britt Wennberg. The day has come! Our album is finally out! 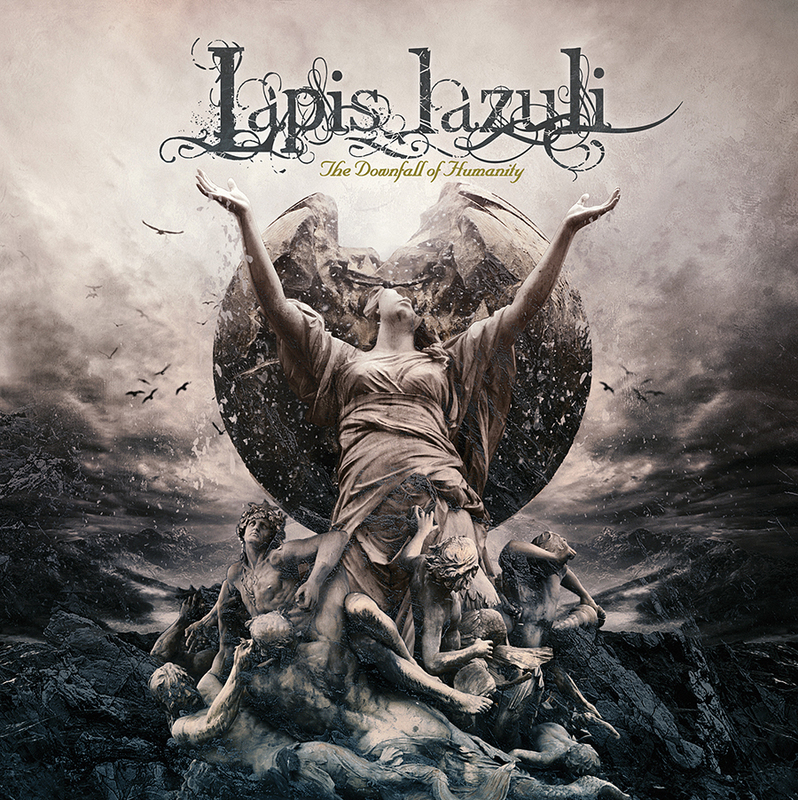 It’s been a long journey and we’ve learned a lot during the process, but here it is… The Downfall of Humanity! I have been following a girl called Klaire de Lys on youtube, and facebook, for a while now. She does these amazing makeup tutorials and they are incredibly inspiring to watch. What I didn’t know though was that she and one of her friends had started a band and were about to release their first EP. I first saw a mention of it on Klaire de Lys facebook page and decided to check it out… and am I glad that I did! Their band is called Malumi and they released their first single, Snow, on December 19th. The accompanying video was beutifully shot and the makeup was really pretty and the music… well, I loved it. It’s gentle and soft, with lovely piano melodies and Klaire’s and Sarah’s voices harmonize really well together. It has a little bit of that haunting and melancholy quality that I am so fond of and it went straight to my heart. Check out the video below. On February 9th Malumi released their next single, the title track of their EP, as well as the whole EP. The song, and EP, is called Lullaby and just like Snow it is a beautifully shot video and the music is lovely, with great lyrics that touched me deeply. I hope you’ll like Malumi as much as I do.